Information on the Dawson Angel. | The mind is an unexplored country. The Dawson Angel, for those who came in late, is the figure that towers over the resting place of Michael Dawson in Melbourne Cemetery. I wasn’t able to discover much about Mickey D from the internet, and I surmised that this huge sculpture was his way of leaving a mark on the city. A man who feels he wasn’t appreciated in life may want to correct that imbalance after he’s gone. A hundred years ago, when inner Melbourne was far less built up, the Dawson Angel might well have been visible from a mile or two away. But my friend Elizabeth has done some searching of her own and found mention of Michael Dawson in the history of Brunswick. One of the first persons from Ireland known to settle in the area was Michael Dawson. He came from a family of landowners in Tipperary, and his name is perpetuated in Dawson Street, which leads to the heart of Brunswick’s civic precinct. He arrived in the colony in 1840 and started building hotels and renting them out. By 1843 he was able to buy Thomas Walker’s huge allotment, which ran from Sydney Road to the Moonee Ponds Creek in the south-west of Brunswick, and he called the locality Phillipstown, after a place in Ireland where a political riot had occurred. 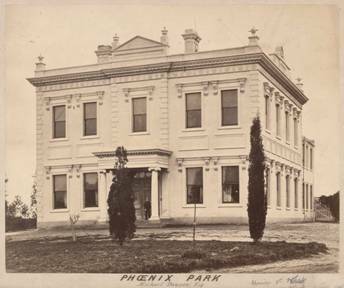 On part of the land he developed the Phoenix Park estate, named after a famous park in Dublin, and on it he erected the mansion known as Dawsonhurst. The Phillipstown name endured into the twentieth century and its last official use was when it was published in a post office directory in 1917. Dawsonhurst in its heyday on the Phoenix Park estate. Dawson’s home was built in 1848 but didn’t survive him long – it was demolished in 1883, only seven years after he died. The Angel was cut from specially imported Italian stone, and did not gain his position until some years – a few decades, actually – after Dawson’s passing. Elizabeth also notes that Mrs Dawson and the Dawson children began a legal battle over the will in 1876. The fighting began pretty much as soon as the old boy was in the ground. If not before. My original guess was wrong. The Dawson Angel wasn’t Michael Dawson’s final vanity – he was a much later arrival. Given the familial war over inheritances it could be that the Angel was simply a means of getting rid of the money and thus ending the arguing. Whatever the motivations, the Dawson Angel is an unsettling presence in the Cemetery. But since he unsettles only the living, there’s nothing at all wrong with that.